A young girl squeezes the nose of the Easter Bunny while posing for a picture during the City of Palestine’ Community Service Department’s Fourth Annual EggNormous Easter Egghunt held April 8 in Palestine. Photo by Cheril Vernon / Messenger. PALESTINE – More than 1,600 children and their families attended the Fourth Annual EggNormous Easter Egghunt event held April 8 in Palestine featuring more than 20,000 plastic, colored eggs. 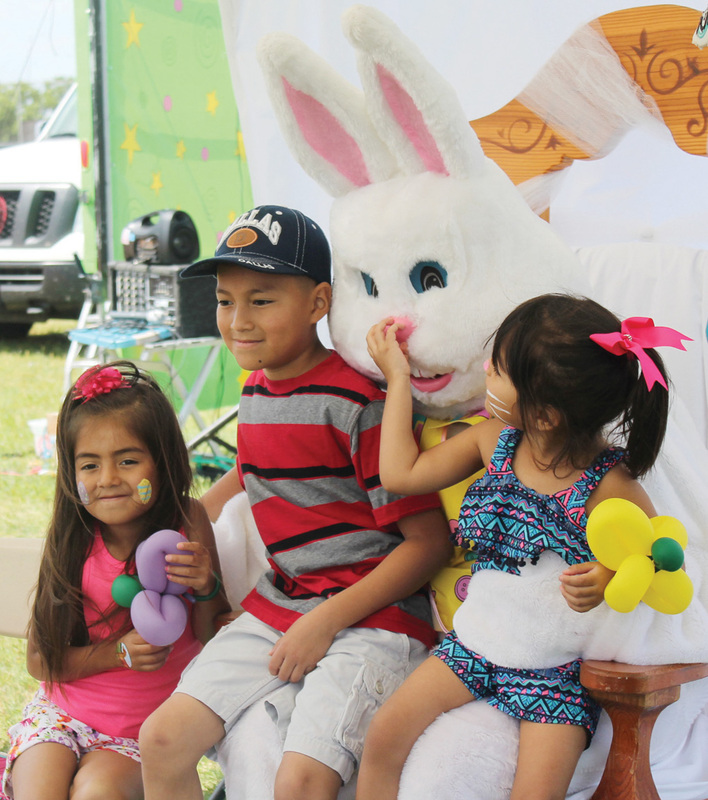 Sponsored by the City of Palestine’s Community Services Department, the event was held at the Palestine Youth Athletic Association Complex, kicking off with Easter egg hunts for different age categories including children ages 1-3, 4-7 and 8-10. Children who found “golden” eggs received special prizes. Besides Easter egg hunts, the extravaganza included a magic show with Korn the Clown, a kiddie train ride, balloon art, a cupcake walk, laser tag, human foosball and more. Children also had the opportunity to play in bounce houses, get their hair and face painted and make crafts. “We want to thank our volunteers for helping out, especially our local high school students who helped with the face painting,” Smith said. The Easter Bunny was on hand to take pictures with the kids, as well as Sparky the Fire Dog, Smokey the Bear, 911 Fox and the Sweet Frog Yogurt frog. Palestine Police Lt. Gabriel Green and Palestine City Council member Joseph Thompson volunteered to be dunked over and over again at a dunking booth. “We would like to thank Lt. Green and councilman Joseph Thomas both for their participation,” Smith said.